Harry Angel will face 11 rivals when he defends his crown in tomorrow’s 32Red Sprint Cup at Haydock. 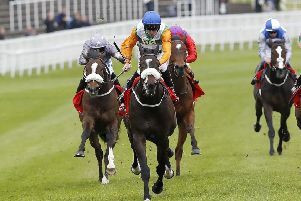 Clive Cox’s charge was a brilliant winner of the six-furlong Group One last season and is favourite to claim back-to-back renewals, despite returning to Merseyside with questions to answer as he makes his first start since suffering injury at Royal Ascot in June. Last year’s runner-up Tasleet and third home The Tin Man are also in the field once again. The Tin Man finished second in the 2016 Sprint Cup and trainer James Fanshawe is hoping he can make it third-time lucky. “The Tin Man seems in good form,” said Fanshawe. “He ran very well in Deauville last time out and he’s run two good races in the past two runnings of the Sprint Cup. Tasleet is one of two runners for leading owner Hamdan Al Maktoum along with the Sir Michael Stoute-trained Commonwealth Cup hero Eqtidaar. David Elsworth’s Sir Dancealot and George Scott’s stable star James Garfield have both been declared after being supplemented on Monday. The Aidan O’Brien-trained Gustav Klimt and Speak In Colours, trained by Joseph O’Brien, are the two Irish contenders. Kevin Ryan’s pair of Brando and Hey Jonesy, Andrew Balding’s Donjuan Triumphant and Sands Of Mali from Richard Fahey’s yard complete the line-up. ASCOT: 1.35 Production, 2.10 Shambolic, 2.45 Ripp Orf, 3.20 Scottish Jig, 3.55 Midi, 4.30 Fille De Reve, 5.05 Bahamian Sunrise. HAYDOCK: 1.50 Dramatic Queen, 2.25 Regal Reality (next best), 3.00 Beatboxer, 3.35 Hochfeld, 4.15 TASLEET (NAP), 4.50 Storm Over, 5.25 Lorelina. KEMPTON: 2.05 Enable, 2.40 Deira Surprise, 3.15 Honey Man, 3.50 Bercheny, 4.25 Konchek, 5.00 Art Of Swing, 5.35 Zalshah. STRATFORD: 2.20 Competition, 2.55 El Terremoto, 3.30 Mizen Master, 4.05 Sporting Boy, 4.40 Cool Sky, 5.15 Ontopoftheworld, 5.50 Itchy Feet. THIRSK: 2.00 Castle Quarter, 2.35 Jungle Juice, 3.10 Play It Cool, 3.45 Right Direction, 4.20 Yes You, 4.55 Blue Mist, 5.30 Rumshak. WOLVERHAMPTON: 5.45 Celtic Artisan, 6.15 Vibes, 6.45 Requited, 7.15 Be Like Me, 7.45 Mr Reckless, 8.15 Dorian Gray, 8.45 Sevilla, 9.15 Spiced.